I am studiously staying away from the blogging by mobile option. Ya'll do not want to see what weird things I'd blog about if I could do it anytime from anywhere. "oh, look! That cloud looks like a bunny!" or "This is what I'm having for lunch"
or "what kind of a bug is that?" This is my coffee-mug that goes everywhere with me. I bought it at a gas station in Maine, on a road trip, thirteen years ago. Now, this is not going to turn into one of those blogs...You know the ones. The blogger tells you all about every detail of every day, "So, like, OMG! I totally found the cutest shoes on sale, and..."
And all those complex memories and emotions are keyed for me by a silly coffee mug with a cartoon lobster. We attach sentimental value to these small things, for what they tether us to. There's something sweet about that. I love stuff like that. I'm not good with change. Having things that anchor me help. 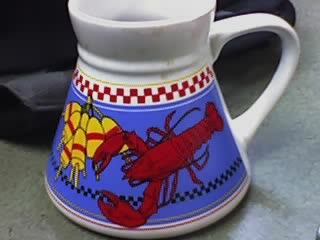 See, that's the funny thing,Doc--I never really intended to hold onto it that long--I certainly didn't buy it thinking, "I'll treasure this silly lobster-mug forever..." I got it because I loathe styrofoam cups, and had a continent to drive across. Then I just woke up one morning, years of changes later, and it's still here. I can't tell you how thrilled I am that my little comment engendered such a wonderful post about a treasured memory. "...but because the first time you ever had tempura was the time you got sold to that white-slaver ring in Shanghai..."
I'm slapping my forehead here! That was you Dawno?!! I was in the shackles two people over! On the left! My hair was blond then. It was a sun thing. I don't believe in dye. Not opposed to all chemicals of course. Many have enriched my life. Well...hot dang. Small world eh? Oh yeah. Nifty mug Mac. Small world- my fiancee is a Bar Harbor native and I lived there for 8 years. I bet you bought that mug in one of the stores operated by the company her mother works for.